Chicago. What comes to mind when you think about this city? To many including myself, violence is one of our first thoughts. In just the past couple months, there were shootings on my block. That makes me sad because I love this city. The other day, I was walking through my neighborhood thinking about all the negativity that darkens this city. But when I really looked around me, my eyes were opened to so much beauty. I chatted with a sweet lady working in the community gardens I passed by and she offered me some of her own freshly picked vegetables. Then practiced my people-watching skills (Yes, I admit, I'm one of those) and saw kids sharing their candy with each other with joy on their faces. I also thought about my friends in this city who work hard to make a difference in Chicago by using their gifts and resources. Near the end of my walk, I stumbled upon these gorgeous rose bushes. So much beauty! In the midst of this city's brokenness, it's easy to forget how much good is happening in Chicago. All we have to do is seek beauty and goodness. But not only that, we need to embrace its goodness and live it so others can find the beauty in the broken. What a wonderful post and a beautiful tribute to your city! You look lovely in your adorable gingham shorts outfit and your smile will definitely brighten up any passers-by while you are people watching (a favorite past time of mine as well)! I would love for you to join my On the Edge of the Week Link Up which goes live every Thursday at 5:00 p.m. EST. There has been way too much violence and hate in the news lately and it breaks my heart. What a sweet post to the city of Chicago and love your summer outfit. 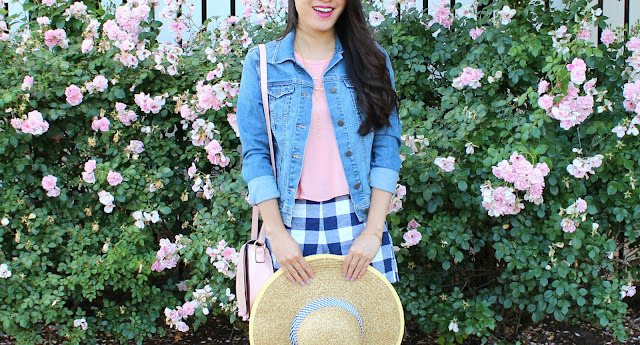 Love your gingham shorts! So pretty and summer-y! Beautiful post. I love to Chicago and it's sad to see what's been going on. Love your outfit. Those shorts are so cute. There is always beauty to be found in the world. 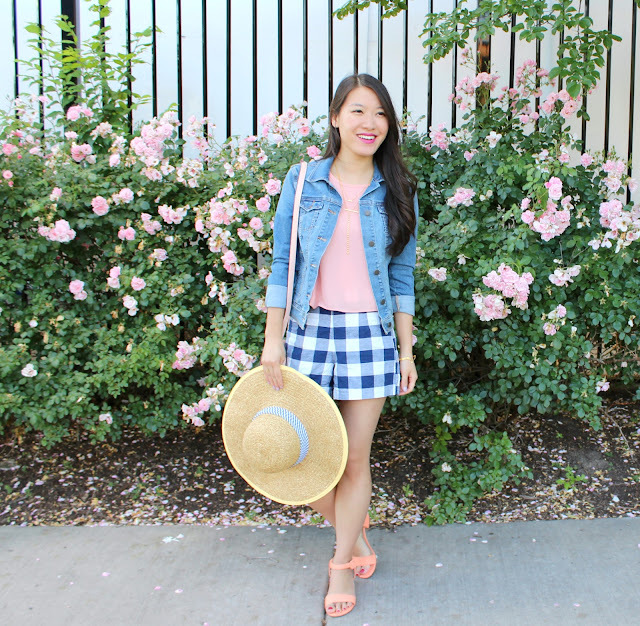 Love your sweet gingham shorts and summery look. Your post is lovely tribute and your outfit is so cute! What a lovely story about Chicago, so poetic. Your outfit is super cute as well! I'd love to see you share this look on my Midweek Inspo Linkup! I love the light pink with gingham. So pretty!